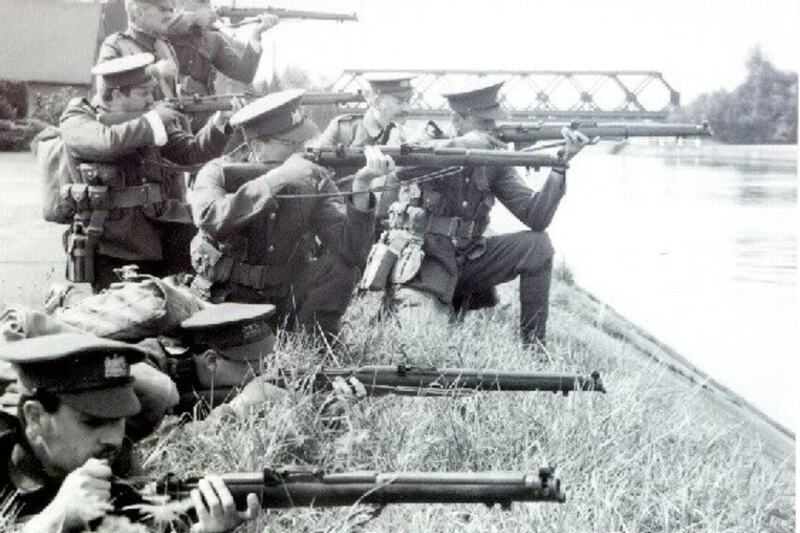 An impression of the Longbow men facing the German assault. 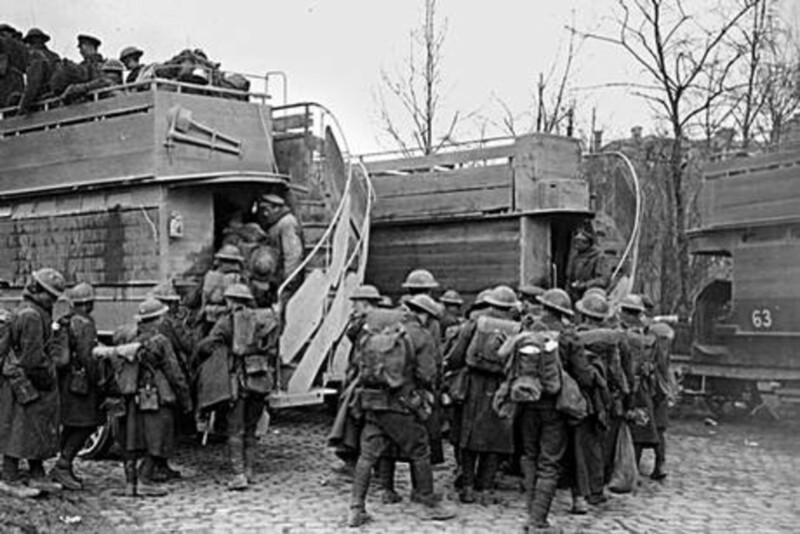 Using London buses boarded up to reach the front line. 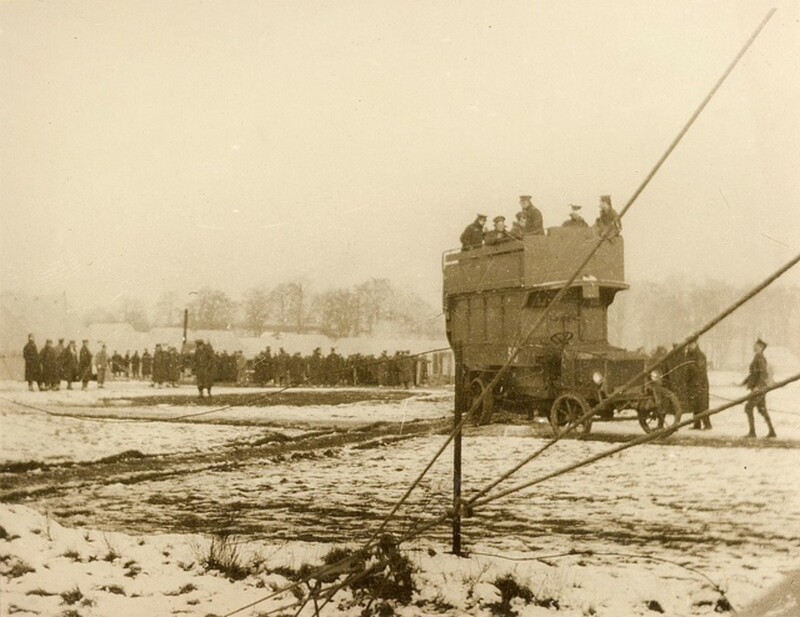 A line of London buses commandeered to move troops to the front line. During the Great War of 1914 to 1918 the death toll was measured monthly in hundreds of thousands and the conditions in the trenches so horrific that many began to doubt their own sanity. Unlike the events that followed 20 years later, troops on both sides were driven by patriotism to fight for a cause they and most of the population, didn’t understand. 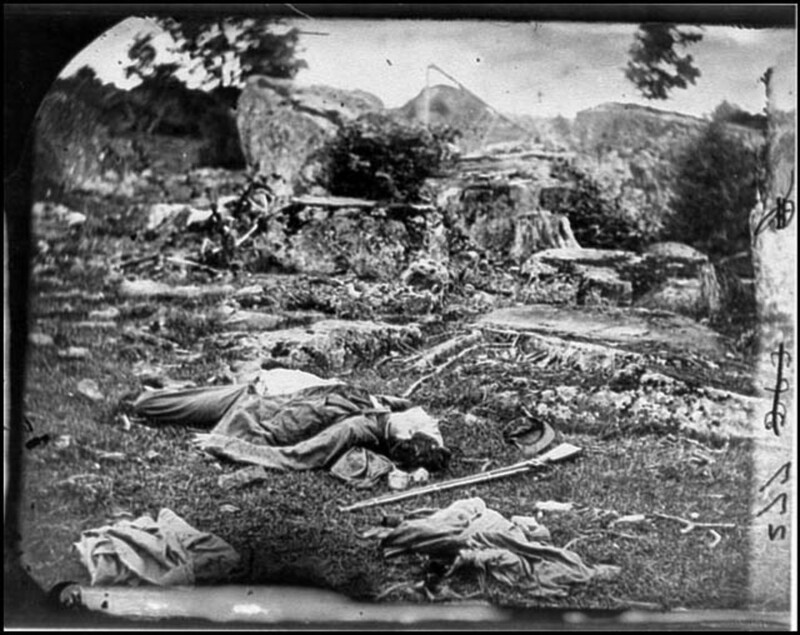 To men who had undergone days even weeks of constant shelling, explosions, running from shell hole to shell hole in stinking heat or thick cloying mud, treading on rotting corpses, a few snatched moments of sleep seemed a luxury. Under these circumstances a man could be forgiving for “seeing” miracles and imagining some saviour to take him away from this hellish situation. Early in the war when the frontline troops were trying to come to terms with this inhuman carnage the British Expeditionary Force was fighting a desperate bloody battle against the advancing Germans. 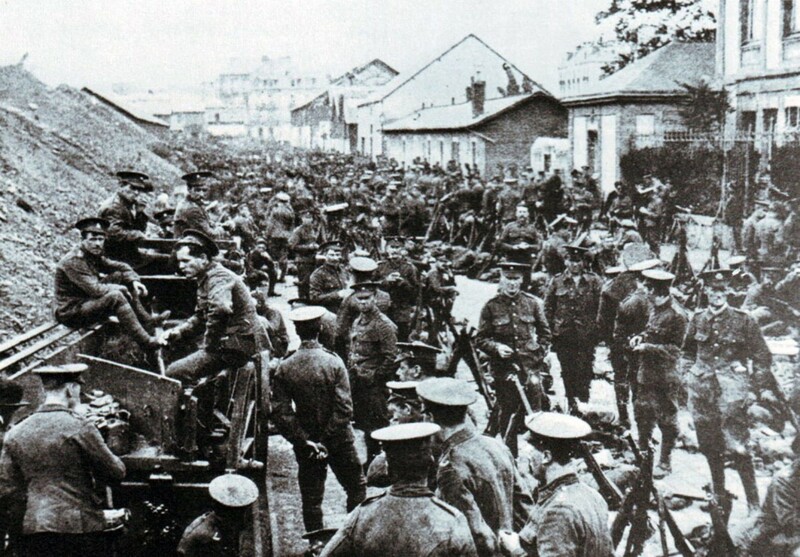 This action was taking place at Mons in Belgium, a drab mining town and the date was 23rd August 1914. The British troops, having been deserted and left to fight on their own by the retreat of the French Fifth Army, were suffering absolute carnage against overwhelming odds when suddenly our soldiers saw remarkable events unfold before their eyes. Two versions of this surreal happening were reported by a large proportion of the blooded tired men. Some swore that a vision of St George appeared together with a force of phantom bowmen that halted the advancing German troops and shot them down in droves. Others, the greater proportion of our troops, saw the apparition of a giant angel in the sky, with two companions, who placed a protective shield around them saving them from certain annihilation. 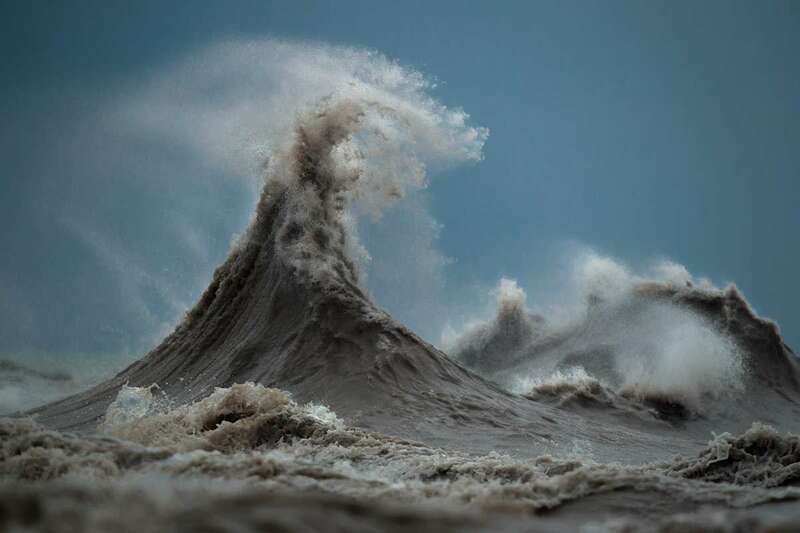 Was this the result of mass hysteria, of hallucinations or was this a genuine miracle? Was the same event reported by the German Army and, if such an event did not happen, why were the totally outnumbered British troops not over-run, killed or taken prisoner? Thousands of people were absolutely convinced that a miracle had happened and within a few months the story of the “Angels of Mons” had become a firm legend. The British Government was distinctly rattled and the Generals were very concerned about the effects on morale. Their reasoning was that if the men believed that God himself chose to intervene, just how righteous was the fighting and even the war itself. Similar concerns affected the German Generals whose men had witnessed the events and who may consider theirs was not a just cause. The politicians and military on both sides had pressing reasons to quash and trivialise the “claimed” event. The Germans hoped for a simple solution but, so the story goes, when the bodies of the German soldiers were examined some contained puncture wounds as if shot with an arrow. Could this be possible? But once the “story” was out there was no dissuading the population? A gothic horror story writer Arthur Machen insisted that the new legend of St George and the phantom bowman was total fiction. He claimed that his short story “The Bowmen” was the real source of the event. It has never been satisfactorily explained how soldiers fighting for their lives would have read or remembered his book let alone had time to contrive such a story, particularly as Machen’s book was not published until some weeks after the event. Despite Arthur Machen’s protests until his dying day, the legend of St George passed into supernatural folklore. 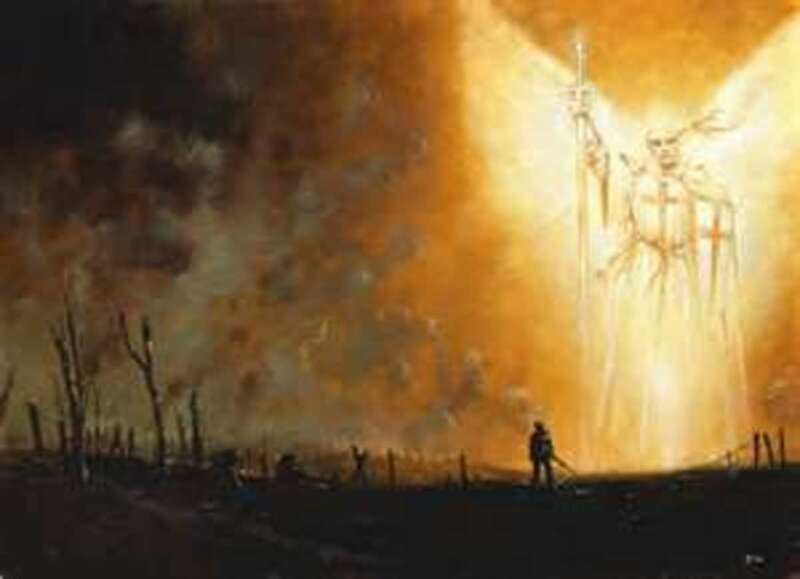 The vision of the angels was even stronger; hundreds of British soldiers of the BEF saw a huge apparition of the angel of the Lord rising above the battlefield and throwing a divine shield between the opposing troops and forbidding further progress. Hardened men dropped to their knees and prayed or wept and fighting ceased temporarily due to this supernatural intervention. When fighting re-started the heavily outnumbered British troops suddenly found they were able to brush aside the vast German hordes, stop the advance temporarily and inflict terrible casualties. Despite this relatively small victory the overwhelming odds continued to force the British to retreat. Some of the Coldstream Guards, being the last to withdraw, became lost in the Mormal Forest and had decided to dig-in to make a. last stand. The men say that an angel then appeared as a softly outlined female figure. They said that she was tall and slim, dressed in a white flowing gown. The Guardsmen followed the glowing figure across an open field where they found a hidden, sunken road which enabled them to escape. Again the initial reaction from the military high command was that in each case it was a hallucination brought about by terrible stress. Although many claimed it was nonsense and the product of deranged minds, the majority of people accepted the wonderful story and the military recorded the events making the incident official, at least. 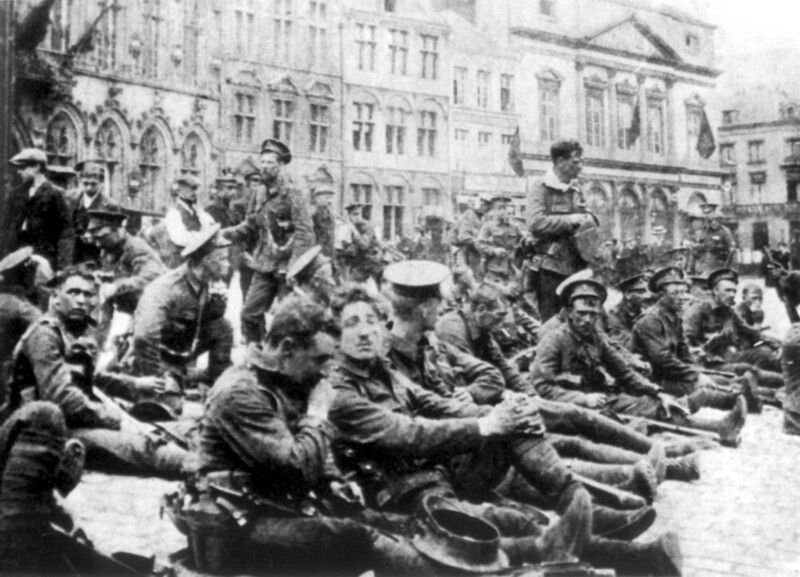 Irrespective of whether you believe the story of the Angels of Mons or not, certainly British troops halted and slowed the overwhelming advance of German soldiers who outnumbered them four to one. At the end of the action Germany had lost 5000 killed and Britain 1600. If divine intervention was involved the loss of 6600 souls seems an ungodly price to pay but when you think of the overall cost in lives of The Great War at 16.56 million (9.72 million military) I think one must question the morality and sanctity of mankind at that point. Contrary to what the Generals feared, the story was big news in Britain and the army recruiting stations were inundated with new volunteers all brimming with patriotism and believing that even God considered ours was a just cause. It was at this point and as mentioned above, the Evening News newspaper asked Arthur Machen to publish his story “The Bowmen”. In this story, British soldiers facing annihilation at Mons in Belgium asked St George for help and were rewarded with phantom bowmen from the Agincourt era who killed the German troops leaving no visible wounds. This story was published on 29th September 1914 some 5 weeks after the apparition appeared on the battleground. 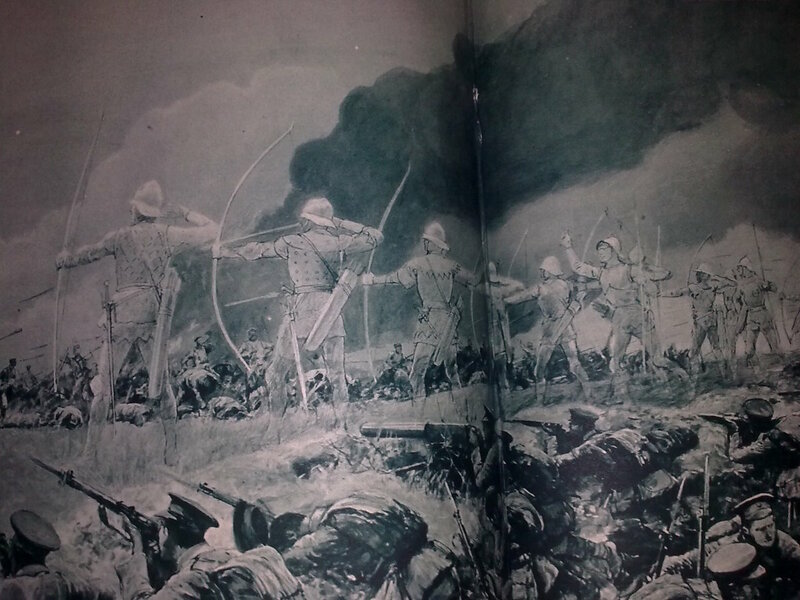 The editor of the Evening News wanted some explanation and Machen strenuously insisted his was a work of fiction, but the public preferred to believe that the bowmen as described by the soldiers was the actual occurrence. 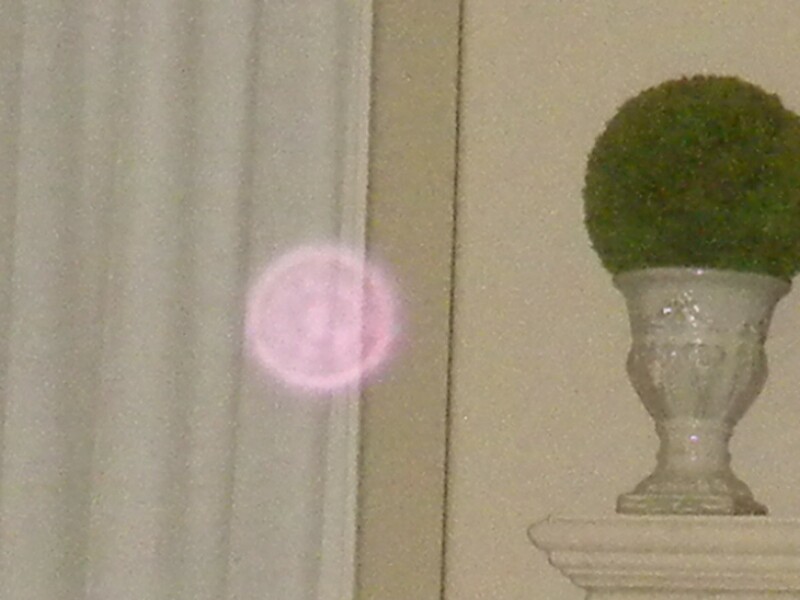 It was not until 1931 that some letters came to light which initially seemed to support the appearance of the angels. `They were in a book published in 1931 by Brigadier-General John Charteris and were his sent to his wife during the Great War. One letter dated 5th September 1914 (3 weeks prior to Arthur Machen’s story “The Bowmen”) talked about the “Angel of Mons” appearing before the troops dressed in white on a white horse carrying a flaming sword. He went on to say the angel faced the Germans and forbade their advance. Charteris served as Chief of British Army Intelligence from 1915 to 1918 in charge of propaganda. His letters are kept in Liddell Hart Centre for Military Archives but strangely there is no letter dated 5th September 1914 and nothing mentioning the Angel of Mons or The Bowmen. He was adept at propaganda and there is some suspicion that he falsified the evidence about the Angel and Bowmen stories. He had done something similar before when he made up an unpleasant story about a “cadaver factory” where the Germans were shipping the dead bodies of their fallen soldiers to have them rendered down to produce oil and lubricants. As with all propaganda, it is most convincing if there is a grain of truth – however the German word “kadaver” refers to animal corpses not human and in fact the Germans were shipping back, by train, the dead horses for rendering. Under the circumstances the evidence of his letters is considered interesting but unreliable. The only story printed in newspapers and illustrated magazines, including spiritualist journals so far was “The Bowmen” and it was not until the 3rd April 1915 before the “Angel of Mons” was mentioned in print. This was in the Hereford Times in an article titled “A Troop of Angels” written by a young lady named Miss Marrable. When interviewed she said that her article came from stories she had been told by soldiers who had been at the battle. She related that two officers had seen the Angels when their company was retreating from the German cavalry, apparently they all turned to face certain death at the hands of the enemy when between them was a whole group of Angels. 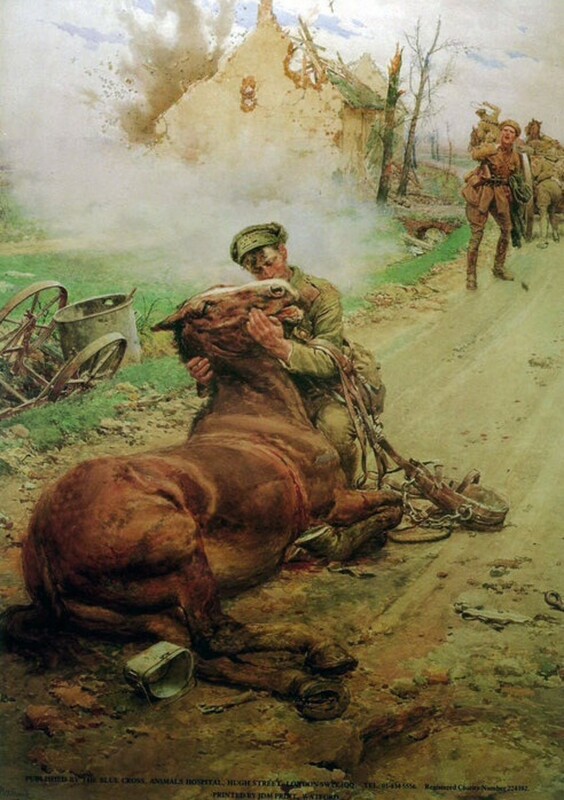 Terrified by the sight that now faced them the German cavalry turned tail and fled in terror. The story was widely reprinted and although Miss Marrable later claimed she had been misquoted, more and more men and officers came forward to claim they knew the events to be true. Various opinions and articles swung wildly between the events being true or not but no official or reliable evidence has been found to corroborate it one way or another. After the war similar questions were asked in Germany but not surprisingly they came up blank. However, there is one version corroborated by German prisoners describing “a force of phantoms armed with bows and arrows and led by a towering figure on a shining white horse” who spurred on English forces during an assault on German trenches. In another story, prisoners spoke of three angelic beings seen by the British, hovering in the air over German lines, providing a source of deep inspiration and comfort for them. It was from here that stories began to circulate that the German bodies had been found punctured with wounds which could only have been made by arrows fired from longbows. The historic records of the regiments most seriously involved in the fighting makes no mention of any such events. The Units that suffered most heavily, the 4th Royal Fusiliers and the 4th Middlesex recorded no visions or strange events whatsoever. Neither did such regiments active in the initial battle or fighting retreat such as the West Kent’s and the 2nd Scots Borderers report anything but the brutal bloody combat. However the heavy censorship at the time means this should not be considered unusual. 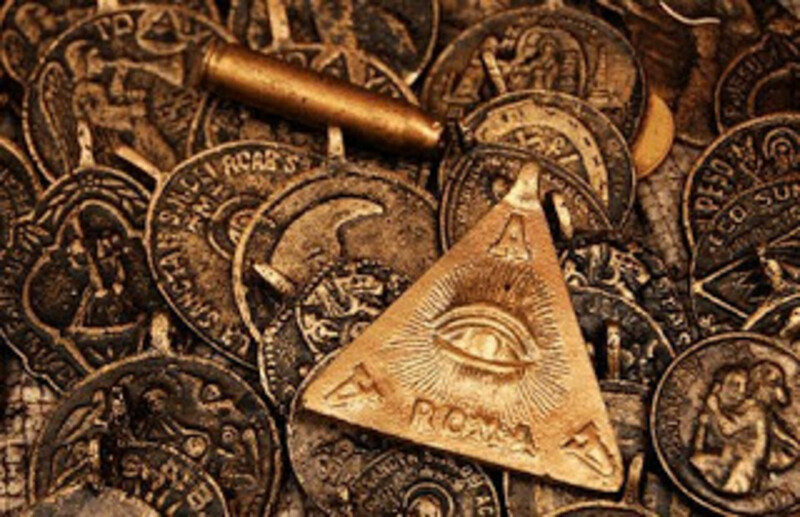 It has long been speculated that events as catastrophic and inhumane as the Great War can trigger supernatural happenings in the world which are beyond our comprehension and defying all science and logic. The Angels and Bowmen weren’t the only unexplained and supernatural incident of the war. In April 1915 a regiment of the First Fifth Norfolk landed on the beaches of the Gallipoli Peninsula in West Turkey. Together with other allies they were tasked with capturing Constantinople (now Istanbul) and planned to take a protected route through the Dardanelles where they could collect supplies. The planning was flawed and, due to the strong Turkish resistance, eventually the British were forced to withdraw after 9 months of fierce fighting, tragically losing hundreds of thousands of men in the process. The most strongly contested area was known as Hill 60 near Sulva Bay and it fell to 5th Territorial Battalion (The Kings Own Sandringhams) of Royal First Fifth Norfolk’s to lead the attack and Colonel Beauchamp with 16 officers and 250 men led on up the hill. August 12th 1915 was a warm day, clear visibility and a light breeze with a small group of low clouds hovering just over Hill 60, these strangely did not move despite the breeze. 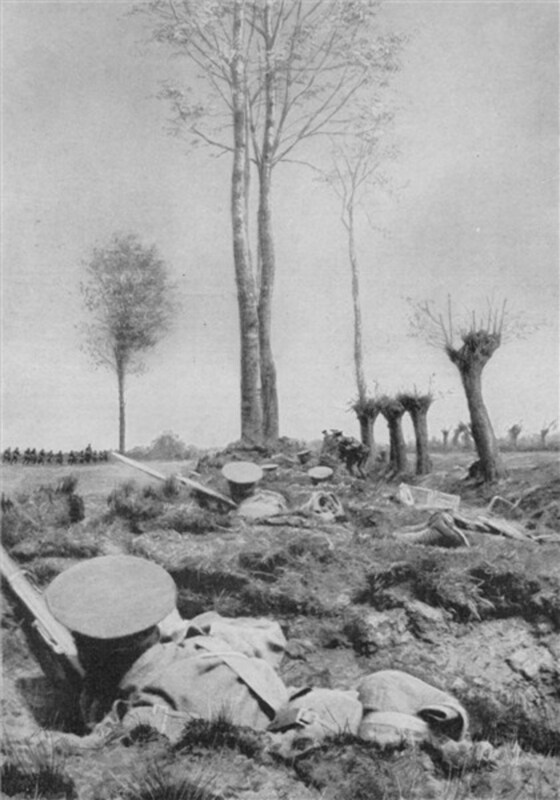 The men fought their way forward against withering fire from the Turkish troops and snipers, until the whole battalion disappeared into one of the clouds. At this point the cloud mysteriously moved vertically away leaving absolutely no trace of any of the men. 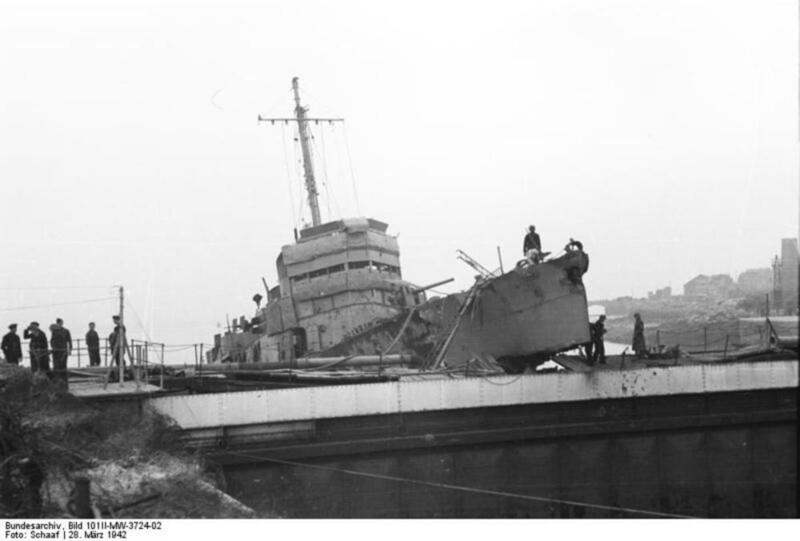 This extraordinary event of the disappearance of the battalion was duly reported to the British Government by the Commander in Chief of the Allied Expeditionary force in Gallipoli. In his report he made no mention of the mysterious clouds, but simply reported that the battalion had been separated from the main body of troops and had inexplicably vanished. The whole battalion was posted as missing, under the assumption being that all had either been killed or taken prisoner. Following the end of the war in 1918 and at the request of King George V the British asked the Turks about the missing battalion. (His interest was because part of the missing battalion was made up from men from his Royal estate at Sandringham – E company) The Turks replied that they had no knowledge of the event and that they had never engaged the First Fifth Norfolk’s. In 1920 the bodies of a few of E company the Norfolk’s were found in Gallipoli and it was tidy to assume these were the bodies of those who died in the initial advance and the remainder probably captured and died in a Turkish Prisoner of War camp, despite the Turks denying all knowledge of them. In the late 1990s Danny Sullivan bought a box of assorted wax cylinders and film tins from a British junk shop. Together with the film were several letters from the 1950s that related stories of angel sightings dating back to the Great War. The box and contents had belonged to William Doidge and he wrote about how British soldiers in 1914 were led into battle at Mons, France (sic - actually Belgium) by angels. A similar sighting of Angels was recorded at a place named Woodchester Mansion, in Gloucestershire, where 20 servicemen died when a bridge collapsed. 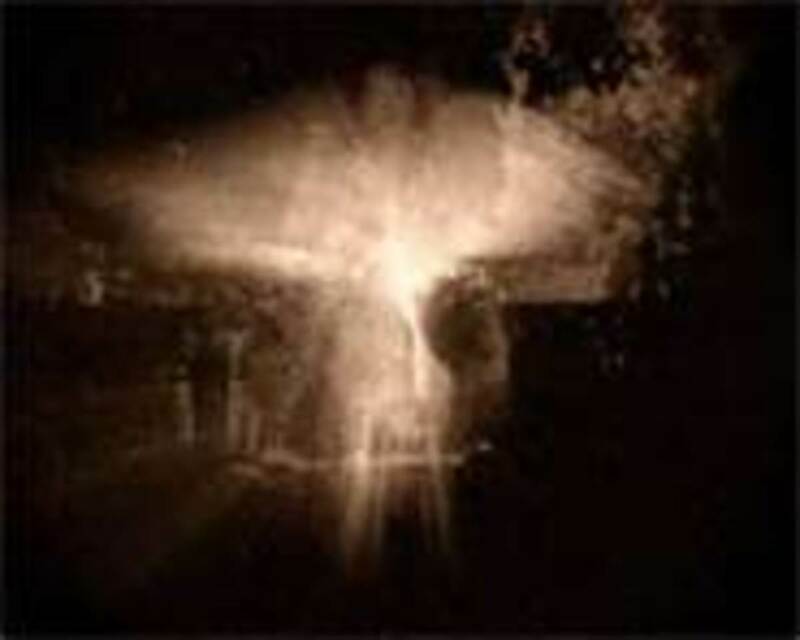 Doidge had searched Woodchester Mansion for evidence of the angel and in 1952, he apparently was “fortunate” to capture an amazing “angel” photograph. Over the years, rumours of this story have persisted due in no small part to the suggestion a film was to be made. With a film offer suggested, moves were made to trace William Doidge but there was no military record and he seems to have never existed.. The Kings Own Sandringhams - . In 1918 the War Graves Commission searched the Gallipoli battlefields to trace those who fell with no known grave. Out of the 36,000 servicemen who died in the campaign, 13,000 were buried in unidentified graves with another 14,000 bodies being simply never found. During one of the searches a Norfolk’s regimental cap badge was found buried in the sand together with the corpses of a number of soldiers. Examination of the area where the badge had been found discovered the remains of 180 bodies; 122 of them were identifiable from their shoulder flashes as men of the 5th Norfolk’s and every one of them had been shot in the head. (this was a favoured method of execution by the Turks, who were not known for taking prisoners.) The bodies had been found scattered over an area of one square mile, to the rear of the Turkish front line 'lying most thickly round the ruins of a small farm'. This was probably the farm at which Colonel Beauchamp had last been seen during his advance up the hill. The question is do we ignore the many recorded sighting of the men disappearing into the cloud or do we just assume they were simply captured and executed? In June 1916 a very bright white cross was reported in the sky over the Flanders battlefield. Both the British and German troops claim that they saw it and its sighting even caused a temporary cease-fire. A rather casual explanation was a cloud formation illuminated by the sun, but this is a rather simple assessment. 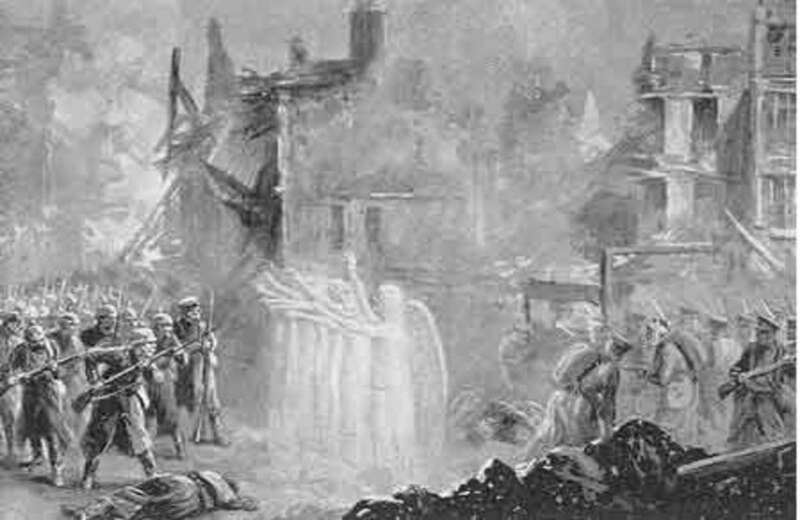 British soldiers claimed the Angel of Mons was St. George. French soldiers however claimed it was Joan of Arc. The German soldiers made no such claim for their patron saint, St Michael. During the English Civil War, at the Battle of Edgehill in 1642, there were rumours of the dead rising from the earth before the eyes of the surviving troops. Later, a battle on Marston Moor reportedly featured a formation of horsemen in the sky. In the Eighteenth century there were heavenly sightings at Culloden and twice at a battlefield called Souter Fell in 1735 where ghost armies were seen and again in 1737. The British soldiers were all experienced and professional troops and by nature very superstitious. Many had served in the Northwest Frontier Province of British India and were well versed with Jinn spirits in human form that stalked the Pathan uplands and were said to precede many night-time silent assassinations. 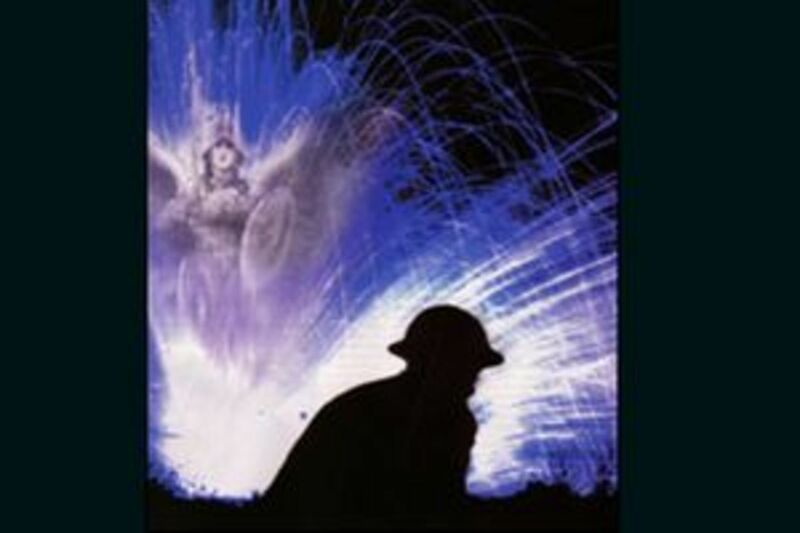 It seems that the Angel of Mons could just be the most recent manifestation of a long legacy of apparitions on the battlefields of British armies or it could be the result of tiredness, fear and supressed hysteria which can affect any soldier. 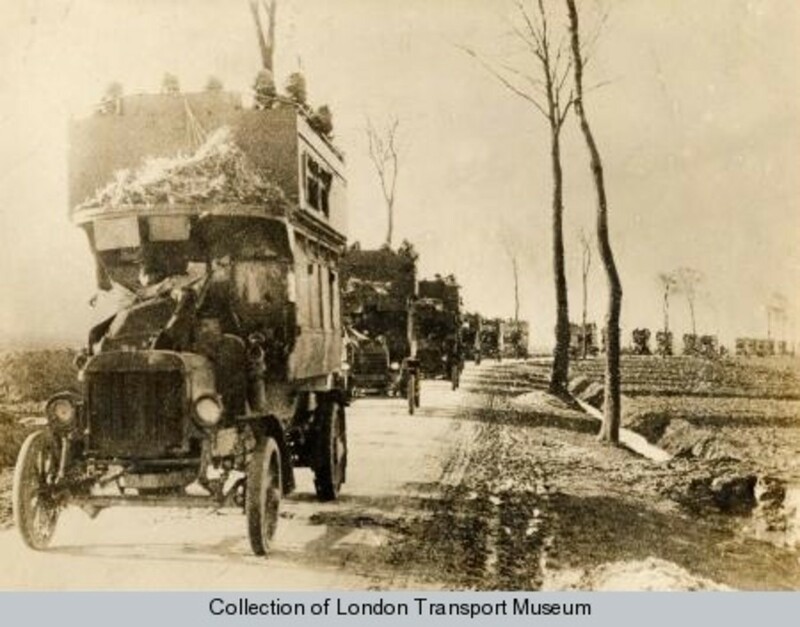 London Buses - A few faded photos of London Buses being used to transport troops to the front line have come to light. In these days of mechanised warfare it must seem strange to see lines of civilian buses but this was cutting edge stuff and allowed rapid redeployment. Who were our imaginary friends as a child ? were they just the result of an overactive imagination or were they perhaps our previous existence. &quot;The Hum&quot; - This strange noise heard all over the world - what is it ? The Hum is a phenomenon which affects people worldwide. It is a low frequency pulsating noise which affects some and not others. No one can give an explanation and it remains a mystery. Do you believe in the Angel of Mons? America's Most Haunted -- Gettysburg, PA "Devil's Den"
My reply to tillsontitan above included the word "sceptical" spelt correctly the English way. Hub Pages, without my permission, have changed the spelling to "skeptical" which may be an Americanism but I am not American and take great exception to some faceless person editing my writing. Without being there I don't think any of us can appreciate the heart stopping horror of the Great War. The young men with their loved ones gaily waving them off to an unimaginable death in the mud and filth many to be never found again. Yes - the rights or wrongs of war aside we owe them a huge debt of gratitude. Thank you for your comments. After my time in the RN I have spent most of my life as a scientist in pharmaceutical and industrial chemistry. As a bunch we have a tendency to feel pretty smug about ourselves, but every so often I come across something that reminds me that I'm not as clever as I thought. My grandmother in Devon (who was a witch incidently) tried to instill in me the ability to accept that nature, God and powers unknown can throw things at us which is beyond a mere humans understanding. The sheer power of fear, death and courage in a situation such as the battlefields of the Great War can stir up and release forces we cannot even conceive. Words seem to escape me today, cannot find the brainwave the will bring forth something profound. There are many things in life where concrete proof cannot be supplied, but this does not mean it did not happen. Much of what we live by is based upon a belief system. Perhaps if we look deeper within ourselves we will begin to understand. You are quite right, many strange and unexplained things can happen in a man made hell such as Mons. Again you have well researched your hub. The facts you've included definitely lead one to think about these events. I believe in God and I believe in miracles so to me, this is a very real possibility. Thank you for introducing me to these events! Thanks for your comments. Monumental events such as the great war really can trigger unusual events. Great post! I found it very interesting. Thank you for your comment Krilco, it is one of the mystery s of the Great War which even today raises a certain amount of conjecture. Never heard this bit of history before--thanks, it was a good read.